True or false? An annulment is a Catholic divorce. The answer? FALSE. A divorce is a civil proceeding whereby money and property are divided up, legal rights are established, and child visitation schedules are established. A Catholic annulment is absolutely none of those things, and is not even related to them. The only common thread between the two is that they occur when a husband and wife decide to split up. An annulment is a formal declaration by the Church that there was never a valid sacramental marriage between the man and woman from the very beginning of the marriage. In other words, one or both of the parties was lying about something at the time they got married, or they were forced into the marriage, rather than of their own free will. The Church investigates the marriage, as well as the history of both of the parties. This requires a formal deposition by both parties, as well as three witnesses each. If one party refuses to cooperate, the other party's deposition stands on its own. The deposition is usually a background paper on how the person grew up, family history, dating history, how you felt at the time you got married, events in the marriage, etc. It's almost like writing your life story. The Church has to have this so that it can make a valid decision on whether both parties were fully committed to each other, and to the Church, at the time of the marriage. If the commitment was there at the beginning, but faded away later, no annulment will be granted. The Church will only grant an annulment if there was not a full commitment at the start of the marriage. For all of this, The Church only charges a nominal processing fee for paperwork. The Church can usually make a decision in about 6 months or so after it receives all of the paperwork. What are some examples of the grounds for an annulment? There could be a shotgun wedding, where one member was forced to marry the other. One of the partners could say that they want children at the time of the marriage, but not really mean it, and be on birth control unbeknownst to the other partner. One of the partners could convert to the Catholic faith before marriage to please the other partner, but then refuse to go to Sunday Mass after the marriage. One of the partners could secretly be a practicing bisexual at the time of the marriage, with no intent to cut off the illicit affair afterward. One of the partners could just be marrying for the other person's money, with no intent to love, honor and obey after the marriage.One of the partners could secretly be a practicing wiccan. 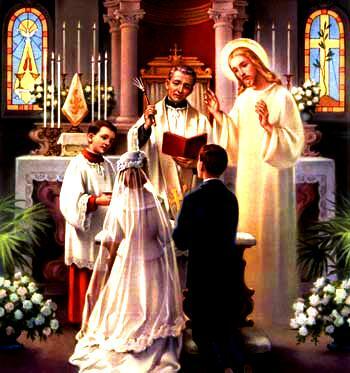 A truly Catholic marriage is a sacramental marriage, where the husband and wife have a true commitment to each other, till death, AND to Jesus Christ and His Church. This commitment must be there from the get-go, or it can be declared annulled. If the commitment was there at the time of the marriage ceremony, but waned later on, then no annulment will be granted. This power of the Church to give an annulment is granted to it by Jesus Christ, in Matthew 16:18-19, when Jesus said that whatever the Church binds on earth shall be bound in heaven, and whatever it looses on earth shall be loosed in heaven. But aren't all marriages forever, as Jesus said in Matthew 19:6? Didn't Jesus say that whatever God has joined together, let no man put asunder? Yes, he did say that, but God does not join every man and woman together, marriage ceremony or not. Some marriages are not pleasing and holy to God, and therefore, in the Church's declaration of an annulment, He did not join the man and woman together at the wedding ceremony. Mark 10:11-12:And he said to them, "Whoever divorces his wife and marries another, commits adultery against her; and if she divorces her husband and marries another, she commits adultery." In other words, people who just get a civil divorce and remarry without the benefit of an annulment, risk losing their immortal soul by breaking the sixth commandment. 1628 The consent must be an act of the will of each of the contracting parties, free of coercion or grave external fear. No human power can substitute for this consent.If this freedom is lacking the marriage is invalid. 1629 For this reason (or for other reasons that render the marriage null and void) the Church, after an examination of the situation by the competent ecclesiastical tribunal, can declare the nullity of a marriage, i.e., that the marriage never existed.In this case the contracting parties are free to marry, provided the natural obligations of a previous union are discharged. Of course, people who get divorced and who do not remarry are still free to receive the sacraments and to be in full communion with the Church. There are good reasons for divorce, such as the other party committing adultery, physical abuse, mental abuse, etc. The problem arises when people remarry after divorce, then demand that they still be allowed to receive communion, and then demand that The Church bless their new living arrangement with no annulment. If you have any questions on this, it's best to go to your local Catholic Church and talk to the priest there. He can guide you in your proper course of action to reconcile yourself with Jesus Christ and His Church.